Life is hard, and the world is crowded with people who find it harder than they can bear, because they are overwhelmed by tasks and responsibilities and challenges and problems and goals and handicaps and...and...and...That accounts for the proliferation of "self help" and "how to" books that attempt to deal with the mounting frustrations and demands of everyday life. But they don't seem to work. Perhaps solutions forged in the crucible of the present are not enough; perhaps the past has more to teach us than the champions of modernity like to acknowledge. 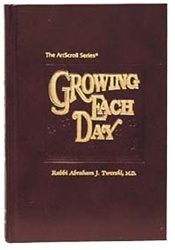 In this book, Rabbi Abraham J. Twerski, M.D. shines the searchlight of the past on the present, on today - to help us survive today, because if we can grow and be productive today, we will be better able to welcome and conquer tommorow. The author mines rich lodes of wisdom and slices them into daily portions. For each day of the year, he selects a pithy saying from the Jewish classics, flavors it with thoughtful, incisive comments, and ends with a resolution for the day. This book succeeds on many levels. It is good reading. It gives strength and insight. It relieves anxiety and broadens horizons. It provides a Torah perspective. And it accomplishes all this without demanding special training or scholarship from the reader. The book is accessible to everyone, and it will be a rare reader indeed who will not benefit from it, day by day. Growing each day is no easy matter nowadays, but Growing Each Day will make it much more enjoyable, pleasant and worthwhile.